Last night, KPIX did a news story about the Clipper cards having some really bad growing pains. One person had video proof of problems with Cable Car conductors not knowing how their portable cardreaders work, another getting charged incorrectly multiple times when transferring from Golden Gate Ferry to Muni, and another getting the runaround with customer service for a wrong charge. 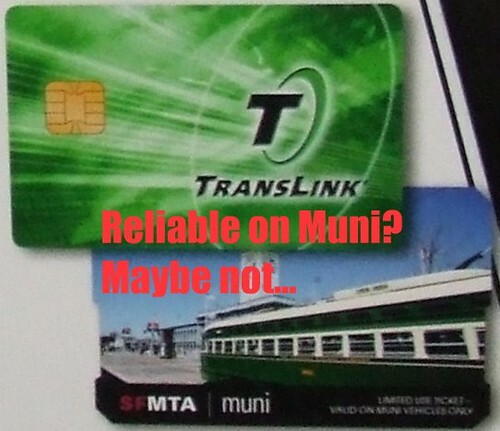 The TransLink/Clipper card was first accepted on Muni's Cable Cars on March 24, 2010 as long as passengers met one requirement, there must be a valid Muni pass on the card. On April 5th, I reported my experiences with my card and the Cable Car conductors and got mixed results with one confirming my pass while another didn't even carry it on him. It started getting odd the conductors have been given explicit instructions to carry the device, but they didn't while other didn't really know how to do it. What really crossed the line is when a Cable Car conductor scanned my card on April 17th and the reader said "NO." I told the conductor there is a pass on there, and he used the features on there to review my e-cash balance and valid passes, and it was listed on there. After that point, I was so fed-up with the problems after problems with the Cable Car conductors not doing their job or lack of training, I went back to a paper pass. When reviewing the KPIX video footage of one of the user's experience on the Cable Cars, the problems have been going on for 4 MONTHS and now Muni will take action by giving their conductors proper training and make sure they have their equipment on hand. I've been giving early warning signs to Muni and Clipper on my blog for months, and they finally listen? GRRRRRR! Clipper might be growing a little too fast. But it's strange that many don't complain about the first two agencies that started first with the TL/Clipper card, AC Transit and Golden Gate Transit/Ferry. These two agencies have been the first two agencies heavily using it, from giving it to East Bay college students to ride AC Transit for free, to automatic discounts for all Golden Gate passengers without the need to buy ticket books. I observe more complaints about Muni using Clipper than anywhere else, but as we all know, Muni has been the punching bag for us city citizens for everything that goes wrong. Nobody likes to experience problems, especially when it involves your own money. You would think it would be easy to resolve, but as with any public agency, welcome to the world of bureaucracy. I should be fortunate that I haven't had any recent serious issues, but that's because I have been sticking to a paper Muni pass and only riding BART with my classic TransLink card. With all these issues, it's common to hear all the gripes now. When Seattle's ORCA card was released to the general public, it also got an earful for all the growing pains, but it's absolutely normal. When everyone understands how things work (e.g. 72-hour policy for Clipper) and customer service is well prepared and trained, things should be better for all of us. I highly recommend for all Clipper users, keep an eye on your account and all transactions. Your online account can give you a report on every single ride you have taken for up to the last 60 days. If you notice a problem, report it to customer service immediately. Be aware, if you see a problem when conducting a transaction on a bus or train, Clipper can't investigate until that transaction shows-up on your ride history report, which can take a day or two. The 72 hour policy should be considered a bug and not accepted as policy. The readers should be updated at least every 24 hours. It all depends if the vehicle reports back to the depot for the night to get their update. They are just being overly cautious. Any predictions about how MUNI is going to handle the "A" expiration? I'm an A pass buyer through Wageworks and I've been sticking with paper and will do so on MUNI until I'm forced onto the card (I do have a Clipper card for extra-SF BART rides and GG Ferry). I'm not sure how Muni is going to handle it. When I received my August "M" pass in the mail from Commuter Check, it came with a letter informing us to prepare to use Clipper. Instead of the debit card route you can ask your employer to look into the Clipper Direct program. With this service your electronic transit pass or ecash will automatically show up on your Clipper card by the 1st of each month and your own online employee account lets you change the pre-tax deduction and passes monthly. I am having some problem with my Clipper account, and am wondering if you can provide any insight from your experience. I ordered a new Clipper Card in June, and in July I ordered Muni A Fast Pass (for benefit month August) via Wageworks. On 07/11, my wageworks account showed that funds (pre-tax $70.00) have been deducted and sent to Clipper (they still display it as Translink). My July paycheck also confirmed the same. However, when I used my clipper card (for the first time) in Bart at Powell station (entry and exit at the same station as I just wanted to test it out), it deducted money from my e-cash account (I didn't put-in any money in clipper's e-cash account, so don't know where that came out from). I called Clipper support and they informed me that there is no Muni Fast Pass on my clipper card and passed the buck to Wageworks. I called up Wageworks today, and they are passing the blame to clipper saying that they have uploaded it on the right card, and it's Clipper's fault. I have opened a case at Wageworks, but I don't know if I should be too hopeful about it. It seems that my Fast Pass got lost in the integration system b/w Clipper and Wageworks. Do you know of anyone else facing similar issues? It would be great if you could provide some pointers on how to sort out this mess. Monty: I had to reject your other comment on a different blog posting because it was basically the same issue you just mentioned. My best advice is to ask for a Wageworks debit card so you can buy it yourself at automated machines. I don't have much trust in letting Wageworks and Clipper do it automatically.